Last year, Gary McHale shut down the illegal Enbridge Line 9 occupation with a single letter to the Hamilton Police. Now, he and his wife have done it again. CALEDONIA – Haldimand County Council has voted to dismantle a blockage set up by protesters at the entrance of the former Douglas Creek Estates. Mayor Ken Hewitt said the vote happened in camera Monday night. The county will be hiring a contractor to take apart the barrier – fashioned with metal, concrete and other materials – at Surrey Street in Caledonia. 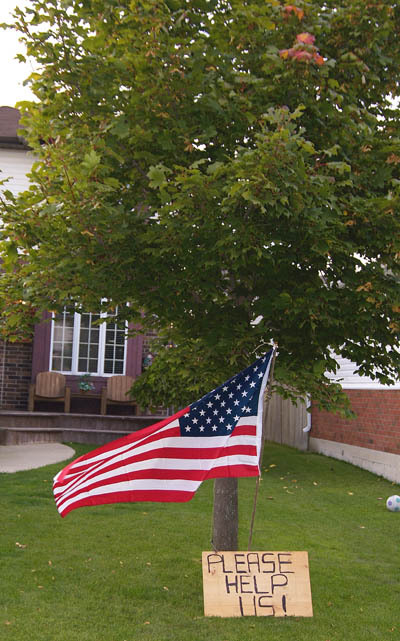 COMING…November 9, 2013! Join us for the launch of this book at the 2013 Freedom Symposium; click on the image to register. Free copy included. 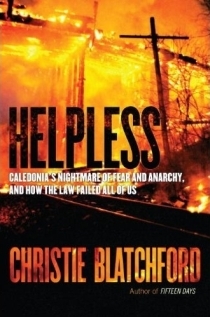 You shared the agony of Caledonia’s victims with Christie Blatchford’s best-selling Helpless: Caledonia’s Nightmare Of Fear And Anarchy, And How The Law Failed All Of Us. 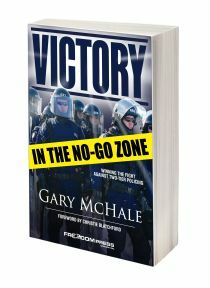 Now…read VICTORY IN THE NO-GO ZONE, Gary McHale’s account of how a small group of Canadian patriots followed Dr. King’s teachings in order to defend freedom against OPP corruption and, in the process, showed Canadians how to fight back…and win when police refuse to enforce the law. Gary names names as he takes you through some of the critical legal battles leading to criminal charges against senior OPP officers, including Julian Fantino and Chris Lewis. Foreword by Christie Blatchford, endorsements by Jerry Agar, Newstalk 1010, and Barbara Kay, National Post columnist. If you want to stop police appeasement of violent radicals in Canada today, or prevent European-style Islamic ‘no-go zones’ from arriving here tomorrow, you need to read the shocking and inspiring story that is Victory In The No-Go Zone. Freedom Press Canada: registration form for the 2nd Freedom Symposium, Old Mill Inn, Toronto, Nov 9/13 where Victory In The No-Go Zone will be released. FREE signed copy included! If you’d like to share in the joy…Victory In The No-Go Zone will be released at the Freedom Press Canada 2013 Freedom Symposium, “Freedom in Canada: Tribute or Eulogy?” on November 9th at the Old Mill Inn in Toronto. 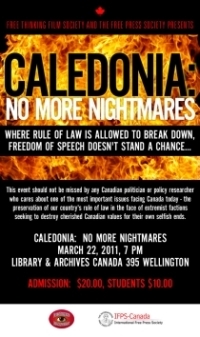 Both Gary and Mark Vandermaas, founder of the Caledonia Victims Project, will be speaking along with other freedom advocates/authors/thinkers. Cost is $75 which includes a buffet lunch and a copy of Gary’s book. Please register now to guarantee your seat. Mark will be talking about the Ipperwash cover-up and its legacy, a topic to which an entire chapter of Victory In The No-Go Zone is devoted. Vandermaas, protesting the protestors, was arrested for the provocative act of raising the Canadian flag across the street from protestors. Were it not for journalist Christie Blatchford’s book about political lawlessness during the Caledonia siege, little of the democratic abomination would have been publicized. The media was largely silent. Christie’s book, Helpless…How the Law Failed All of Us has become something of a classic, and an indictment of the government, the OPP and journalistic negligence that failed to adequately report the standoff. 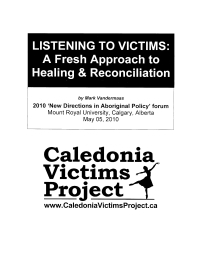 As a former UN peacekeeper and Caledonia activist who has devoted countless hours to denouncing the OPP/McGuinty government’s substitution of ‘peacekeeping’ in lieu of the Charter and Ontario Police Services Act protections the people of Caledonia were entitled to, I want to thank you from the bottom of my heart for ‘Inquiry needed into Caledonia occupation‘ [PDF] (Toronto Sun, July 12/11). 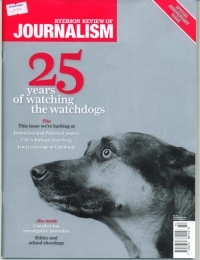 You may recall we had a brief conversation during the 2007 Caledonia Convoy event at Queen’s Park where you mentioned you had been reading our Ipperwash Papers project of which I was the team leader. I am, therefore, profoundly pleased that it was you who now has the honour of being remembered as the first politician in Canada to open the desperately-needed public debate that will allow us to remove the Ipperwash millstone from around our province’s neck once and forever. Bravo! I am optimistic that your words will help us end the shameful, illegal peacekeeping mission on Canadian soil and allow us to move forward via a meaningful and longlasting healing and reconciliation prcess based on truth, justice and apologies, rather than the artifical, short term non-solution of appeasement. No one should assume that Caledonia is all wrapped up with a nice bow because the Caledonia Class Action suit has been settled. Even though the government was forced to write a cheque it can ill afford (politically and financially) the Caledonia story is far from turning its final page. Even when the last lawsuit has been settled, what do we as a province, as a country, say to a family like the Gualtieris, or the Dudychs on the Sixth Line who, with others, lived without policing for nearly four years? What can we do to make up to them for what was done to them by their government while the vast majority of their fellow citizens were content to let them suffer the agony of abandonment? Below are excerpts from my presentations at both the 2010 New Directions in Aboriginal Policy forum at Mount Royal University, and the Caledonia: No More Nightmares event held at the National Library and Archives building in Ottawa on March 22/11 which was sponsored by the International Free Press Society and the Free Thinking Film Society. UPDATED July 09/11 — One of Caledonia’s greatest unsung heroes walked out of court with a victory most never thought would happen. 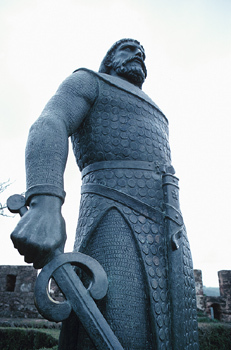 But, the real victory is not the $20M payout for the victims of Caledonia; no, John Findlay’s victory is far more spectacular, and far more priceless than mere money. Lawyer John Findlay went to war on behalf of all Canadians against the full weight of the resources of a provincial government, a lonely, thankless war that took five years — all to defend our precious rule of law during an awful, dangerous time when the Dalton McGuinty Liberal government made a decision to allow the Ontario Provincial Police to suspend – defacto – the Charter rights and Police Services Act protections of an entire class of citizens in order to appease a small, violent, racial constituency. Those of us who are intimately familiar with the goings-on in the courthouses forced to deal with the Caledonia crisis know just how hard the Attorney General’s taxpayer-funded lawyers and the Ontario Provincial Police worked to legalize native lawlessness against innocent people. For a time I wondered if anything would pull us back from the anarchy we were fighting, back from the brink of, yes, civil war. If McGuinty and his lawyers and police had their way that could easily have been the legacy left for our children. People were losing hope that the police would ever protect them again, and some may never lose their fear of being abandoned by the law again. Thanks to one remarkable lawyer named John Findlay, however, the rule of law in our country is a whole lot safer.